Are you really naked under those gloves? Regular gloves or mittens getting in your way, or they just don't cut it? 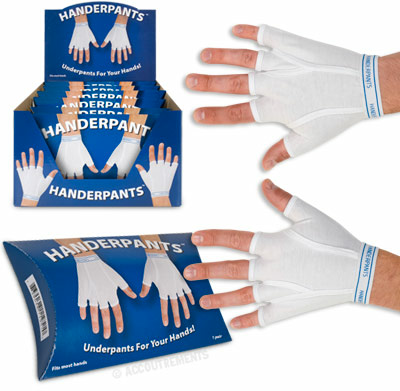 Try HANDERPANTS - underpants for your hands! Keep your hands nice and cozy with these fingerless gloves. These 95% cotton, 5% spandex, fingerless gloves have the look & feel of men's briefs so slip them on underneath your gloves for extra warmth plus excellent protection from chaffing! Hundreds of uses - texting, construction, cooking, cruising, the elderly, and even night blogging! One pair. Fits most hands.